Nomad ... set to be the world’s largest entrepreneurial and media hub. Dubai-based conglomerate Al Ahli Holding Group plans to develop the world’s largest entrepreneurial and media hub to facilitate and support the growth of local and international entrepreneurs. Nomad is an ambitious one-million-sq-ft hub which will be developed close to The Echo Plex (off Al Ain Road). A global prototype, it is set to radically change the entrepreneurial landscape. The project’s infrastructure will be developed over a two-year period, with the first phase to be launched at the end of 2018, comprising the hub of co-working and studio resources along with a pilot co-housing community. 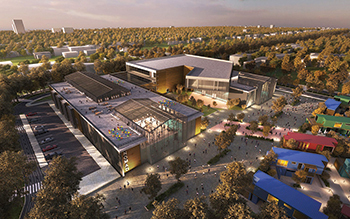 The second phase, accommodating larger facilities and community development, will launch at the end of 2019. The multi-faceted and all-inclusive incubator and accelerator model will focus on growing, incubating and funding talent. As well as flexible office and working spaces, the world-class development will comprise state-of-the-art studios and makerspaces within the media, culinary arts, arts and design, and gaming and technology arenas; with one of the largest 3D printing facilities globally. It will also boast subsidised co-living arrangements, thereby enabling members to live economically while focusing their efforts on business growth. It will enable small and medium enterprises (SMEs) and talented start-ups, from home and abroad, to develop and nurture their businesses supported by a business and legal framework. Operating costs will be significantly reduced, thereby attracting the international business community, and sources of innovation to the UAE. Members will also see their businesses boosted by access to Al Ahli Holding Group’s extensive network of partners and consultants, many of which are in the entertainment and media industries. “Drawing on our decades of experience in establishing new ventures and realising ambitious business plans, we are delighted to be bringing to fruition a world-first concept which will have a huge impact on the future economy and prosperity of the UAE. It’s a project which furthers significantly the endeavours of Vision 2021 and we are delighted to be making this very positive contribution,” he adds.